Films depict historical scenarios that would have been improved by smartphones. Against a media narrative that insists phones are damaging society and wrecking our mental health, Three is using its new campaign to argue that "phones are good". Created by Wieden & Kennedy, the work includes a series of video executions depicting historical scenarios that would have been improved if only the protagonists had had a smartphone available. They include Henry VIII browsing for new wives on Tinder – thus preventing the executions – and cavemen ordering a Deliveroo. The ads were created by Tom Bender and Tom Corcoran, and directed by Ian Pons Jewell through Friend, with media handled by Mindshare. Three partnered Instagram, Deliveroo, Snapchat, LinkedIn, Tinder and Google Maps, and the executions feature scenes involving each of the apps. Samsung is the overall campaign partner. The activity launches today (17 October) on social and will debut on TV tomorrow and in cinemas next week. The full two-and-a-half minute film will be rolled out on YouTube and in cinemas, while 60- and 30-second spots will be used on TV. The video executions will be supported by out-of-home. Three has also commissioned London painter Reuben Dangoor to reimagine historical figures and paintings through the lens of social media profile pictures. The work will be exhibited at a bespoke gallery in Soho Square in London during 26-27 October. 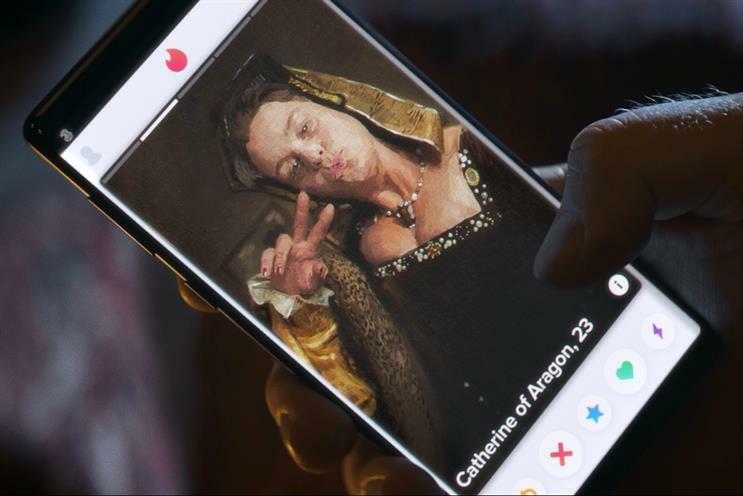 Three will also give a series of major stores a gallery-style takeover, from today, with historical paintings reimagined with mobile technology. In addition, near Halloween, a group of social influencers will be tasked with going about their daily lives without their phones. Speaking to Campaign, Three’s chief marketing officer, Shadi Halliwell, said the aim of the campaign was to drive brand consideration and start to chip away at the high proportion of consumers who reject the brand. That figure, which currently stands at 40%, is "based on perceptions of our past", Halliwell said. "Many years ago, we didn’t have a good network. We’ve never lost that [reputation]." But the reality, she said, is that Three today is ranked the second-best UK network by performance data tracker RootMetrics, has the highest NPS [net promoter score] of the four main brands and is the best network for data. In order to attract higher-value consumers, especially tech-savvy older millennials, to consider Three, it needed to moved its perception forward in several related ways, Halliwell explained, since it was seen as low-price and used characters and ideas that resonated mostly with younger consumers. Recent campaigns featuring Three’s hybrid animals, such as the "puggerfly", had "a level of maturity missing", she said. "We need to grow up and we’ve got to put some stature in." But the campaign was also informed by the fact that Three customers use far more mobile data than those of other networks – something that Halliwell said presented a clear opportunity for the brand. "The industry is dull and corporate," she said, "but we are the network that was built for data – that means our customers have more fun on their phone than anyone else." These two factors meant Three’s marketing had to be both "playful" and "premium", Halliwell said. The team had found in testing that the premium production values of the ads led viewers to regard the brand as more valuable than it is currently appraised. The ballsy message of the latest campaign comes at a time when it often seems as though brands are more concerned about mitigating the negative aspects of their products than celebrating their core benefits. For examples, look to Heineken’s anti-drink driving campaign or Coca-Cola’s recycling messages. Halliwell admitted that some people would be riled by Three talking about how great phones are when "everyone’s saying they’re frying our brains and ruining our lives" – but she also said there was no real choice. "We’re a phone company, so we have to believe that phones are good. And the people we want to attract – they can’t put their phones down because they know they’re good." As well as launching the latest campaign, Three has today been rapped by the Advertising Standards Authority for a claim on its website that its Go Roam product could be used in 71 destinations "at no extra cost". The watchdog ruled that this was misleading because, in reality, usage was limited to either 12GB or 13GB of data, meaning that anything over this threshold would be charged. Three told the ASA that those limits were far in excess of the average data used by customers either on holiday or in the UK – with the latter figure just 1.9GB, according to Ofcom. A spokesman told Campaign: "Go Roam has saved our customers billions of pounds since its launch in 2013 – years ahead of other operators being forced to offer roaming at no extra cost. "We stand behind our claim as the fair use policy was carefully set at a very high level so that it doesn’t affect the overwhelming majority of people."